Objects of Resistance was as a public, interactive performance made during the 2017 Women’s March, wherein newspaper headlines announcing Donald Trump’s inauguration were “blacked out” with thread using sewing machines. Brought together through personal and digital networks, Concordia students and the greater Montreal community were invited to transform their frustration, anger, and pain into objects of creative protest, solidarity, and resistance. In Objects of Resistance, sewing machines, traditionally associated with femininity and “women’s work,” are used as a powerful tool for refusal and erasure. 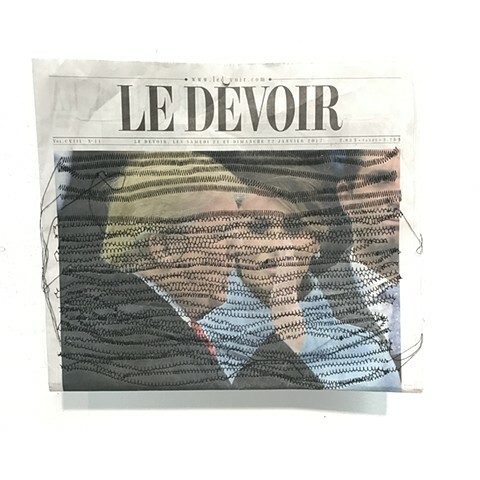 The newspapers are pierced hundreds of times to create drawings that obscure the images and headlines they bear. Over the course of twelve hours, more than fifty local, national, and international newspapers, who’s headlines made many feel angry and powerless, were transformed into radical objects. These works speak to the power of creativity, ingenuity, and community in resisting in intolerance and injustice.